With any order you place at BlueSkyDrugs.com there is a $10 shipping and handling fee for each package sent anywhere in the United States. All packages arrive by regular United States Postal Service mail. Please allow 8 to 12 business day delivery for Canadian orders and 16 to 18 business days for international orders from the time your order has been confirmed with you. If for unknown reasons your package does not arrive, we will reship your package at no extra cost. We strive to have your order processed and filled within one business day of receiving your complete order. 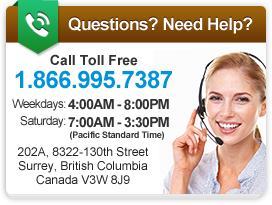 If you require further information regarding your package please feel free to contact our Customer Service Specialists toll free at 1-866-995-7387 who will be happy to assist you. BlueSkyDrugs.com provides security by offering 128 bit secure socket layer through security metrics. 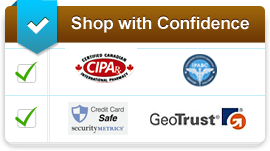 This program protects identity theft and credit card fraud. BlueSkyDrugs.com has also taken reasonable security measures to protect personal information from loss, unauthorized access, destruction, misuse, modification or disclosure. As far as permissible under law, BlueSkyDrugs.com accepts no responsibility for the unauthorized access of personal information held by BlueSkyDrugs.com. You must have a valid prescription from a physician licensed to practice medicine and to prescribe medications in the place where you live. The only order BlueSkyDrugs.com will process without a prescription are over-the-counter products. BlueSkyDrugs.com will not handle any habit forming or narcotic pharmaceuticals, also known as scheduled drugs or controlled substances in some countries. We specialize in chronic care medicines that many people must take to sustain or improve their life. BlueSkyDrugs.com collects the following information regarding all visitors to this site: domain name, IP address, information regarding what pages are accessed, information volunteered by you (such as e-mail address when filling out feedback form), and length of time spent on the site. BlueSkyDrugs.com collects and logs this information for statistical purposes. BlueSkyDrugs.com also uses this information in order to provide you with a better, more meaningful experience when you visit in the future. Through analysis of these records, BlueSkyDrugs.com improves and updates the site to improve your experience. Other than stated above, no attempt is made to identify users or their browsing activities except, in the event of an investigation, where a law enforcement agency may exercise a warrant to inspect logs, or where BlueSkyDrugs.com believes it is required to collect and produce relevant electronic documentation to fulfill its obligations to third parties, including statutory organizations under local law. BlueSkyDrugs.com endeavors to use and disclose your personal information only in limited circumstances. BlueSkyDrugs.com will do so if it is necessary to protect any copyright or intellectual property in the material in the website, or if it is necessary to enforce the BlueSkyDrugs.com Website Terms and Conditions of Use. The contents of this site, such as text, graphics, images, information obtained from BlueSkyDrugs.com's licensors and other material ("Content") contained on this site is for informational purposes only. The content has not been evaluated by the FDA and is not intended to be a substitute for professional medical advice, diagnosis or treatment. Always seek the advice of your physician or other qualified health providers with any questions you may have regarding a medical condition. You should seek medical attention before undertaking any diet, exercise or other health program described on this web site. BlueSkyDrugs.com does not recommend self-management of one's health care. Reliance on any information provided by or via the Site is solely at your own risk. Information obtained by using this site is not exhaustive and does not cover all diseases, ailments, physical conditions or their treatment. The Content provided by BlueSkyDrugs.com is compiled from numerous sources. BlueSkyDrugs.com and its directors, officers, employees, licensors, suppliers, agents and independent contractors, do not directly or indirectly practice medicine or provide medical services as part of BlueSkyDrugs.com. Should you have any health care-related questions, please call or see your physician or other health care provider promptly. You should never disregard medical advice or delay in seeking it because of something you have read on the Site. If you think you may have a medical emergency, call your doctor or 911 immediately. This web site contains health or medically related materials, including information about women's reproductive issues, that you may find sexually explicit or otherwise offensive. It may not be suitable for children or other sensitive people. You are solely responsible for compliance with the laws applicable to your domicile. BlueSkyDrugs.com is not liable for any personal injury, including death, caused by your use or misuse of the Site or Content or by any products you purchase from a third party. In no event shall BlueSkyDrugs.com or any third parties be liable for any damages (including, without limitation, incidental and consequential damages, personal injury/wrongful death, lost profits, or damages resulting from lost data or business interruption) resulting from the use or inability to use the web site or the Content whether based on warranty, contract, tort or any other legal theory, and whether or not BlueSkyDrugs.com is advised of the possibility of such damages. Any liability of BlueSkyDrugs.com shall be limited to the actual damages incurred by you, not to exceed U.S. $1000.